New Jersey-based duo's infectious sound is equally indebted to the British invasion and heartland rock. 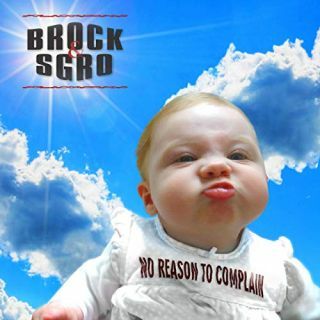 New Jersey-based singer-songwriters Alan Brock and Chip Sgro have unveiled their debut release as Brock & Sgro, No Reason to Complain. Below, check out the album opener "Struggle to Keep Pace," as well as a glimpse of Sgro's impressive guitar collection. Weaving together alternative rock and power pop influences, Brock & Sgro create an infectious sound that is equally indebted to the British invasion and heartland rock. Handling all the songwriting, vocal and guitar duties themselves, the duo is supported by the seasoned rhythm section of bassist Bob Sproviero and drummer Ken Trimmer. The driving "Struggle to Keep Pace" kicks off the album, followed by pop-rock gems "Take Me," "19 To 1," "Through the Haze," and the captivatingly percussive "Can You Hear Me Scream." Brock & Sgro demonstrate their versatility as songwriters with acoustic-driven numbers "The Wheel," "To Be With You," and the haunting "Soldier’s Song." Sgro, an avid guitar collector, was kind enough to share some exclusive photos of his drool-worthy lineup of axes, and you can check those out below. Listen to No Reason to Complain on iTunes and Spotify today. A look at Chip Sgro's impressive collection of guitars (and baseball memorabilia). The GIbson Trilogy — '37 L-00, '42-43 J-45, and '55-58 J160E. 1967 Epiphone Casino and Les Paul Custom Lucy. 1965 Hofner bass, 1963 Gretsch Tennessean, and Rickenbacker 325 Reissue.